The apartment sector across Sydney and Melbourne has shown stronger conditions relative to detached housing, a trend that has been evident since mid 2017. Regional markets are now consistently outperforming the combined capitals. The stronger combined regional markets performance continues a trend that began to emerge in October last year where regional housing markets showed an overall improvement in the pace of capital gains while the combined capitals trend softened. 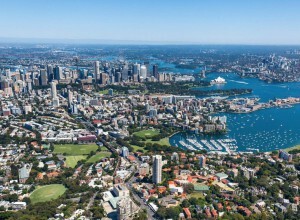 The broad-based falls highlight that the softening trend in the Australian housing market is largely due to weaker conditions in Sydney, however, most other capitals are also recording subtle falls. Dwelling values were steady over the quarter in Brisbane and have continued their strong run of growth across Hobart, up +3.4%. The unit sector across Sydney and Melbourne has shown stronger conditions relative to detached housing. The March home value indices results also confirm that the unit sector is now consistently outperforming the detached housing market – a trend which has been evident since mid-2017. The stronger performance is subtle at the combined capitals level: capital city house values were down 1% over the March quarter while unit values were down a more moderate 0.7%. More significant differences between houses and units can be seen in Sydney and Melbourne where housing affordability pressures are more evident relative to other cities. 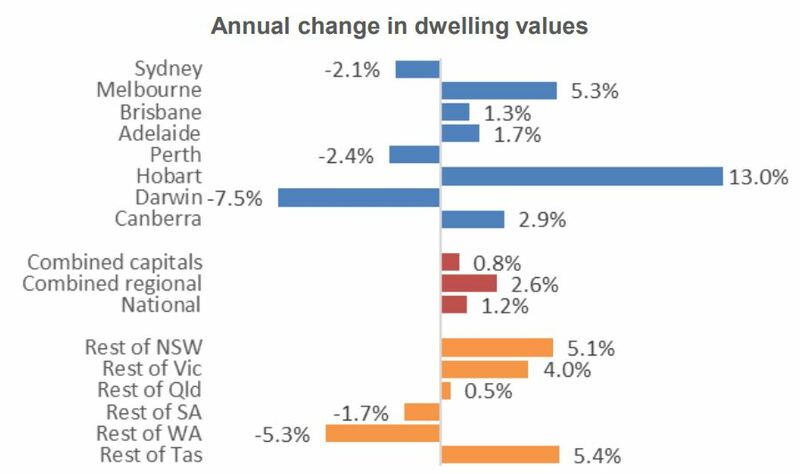 Sydney unit values are up 1.9% over the past twelve months, while house values are down 3.8%. Similarly in Melbourne, unit values are 6.6% higher over the past twelve months while house values are up just 4.9%. 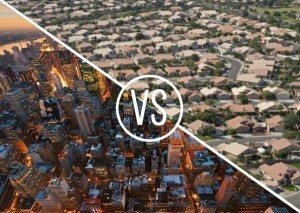 The stronger performance from the unit sector may suggest that buyer demand is becoming more concentrated in the medium to high density sector where entry prices are lower and commuting times are often more convenient when compared with the detached housing markets around the outer fringes of the city. The surge in first home buyer activity since stamp duty concessions became available in July last year may also be supporting demand across the medium and high density sector where prices are often better aligned with first time buyer budgets. Houses show a stronger performance to units outside of Sydney and Melbourne. Every other capital city has seen the detached housing sector outperform the unit market over the past twelve months. In Brisbane, where concerns around unit oversupply have been evident, unit values were 1.4% lower over the past twelve months while house values moved up by 1.8%. While capital city values are still trending lower, the rate of decline is now easing. This is particularly evident in Sydney where month-to-month falls have generally been more substantial than other capital cities. 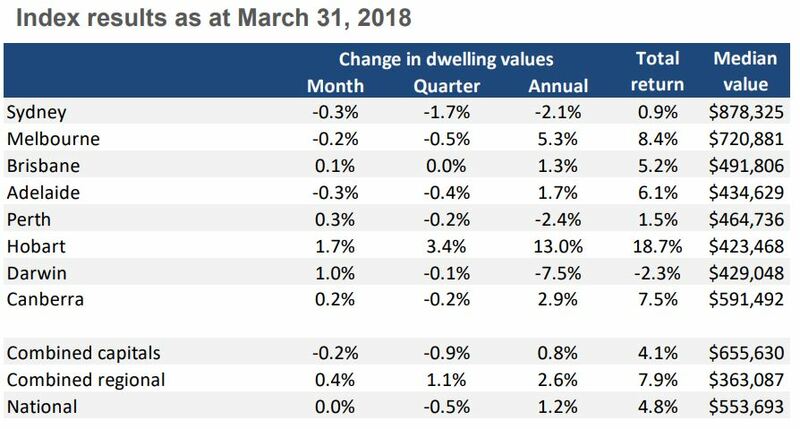 In December 2017 and January 2018, Sydney dwelling values were falling at a monthly rate of 0.9%, reducing to 0.6% in February and now 0.3% in March. If the trend towards an improving rate of decline persists, the Sydney housing market may have already moved through its peak rate of decline, after dwelling values have fallen by 3.9% since their end of month peak in July last year. Across the broader regional markets, the strongest performing regional area is now Tasmania, where dwelling values outside of Hobart are 5.4% higher over the past twelve months. 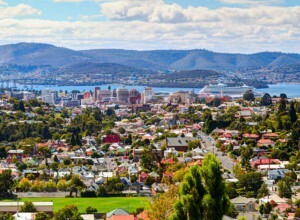 Like Hobart, regional Tasmania is benefitting from an influx of capital from Sydney and Melbourne, as well as higher interstate migration rates as new residents take advantage of the low housing prices and improving economic conditions. On a more geographically granular basis, the best performing regional areas tend to be located on the periphery of the Melbourne, Sydney and Canberra metropolitan regions where demand appears to have rippled away from the more expensive metropolitan suburbs to the satellite cities. 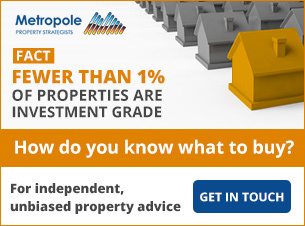 Outside of the capital cities, Victoria’s Geelong tops the list for strongest value growth over the past year, where dwelling values are up 10.0% over the past twelve months, followed by New South Wales’ Southern Highlands and Shoalhaven (+9.5%) as well as the Capital Region of New South Wales and Newcastle/Lake Macquarie, with both regions recording values 8.3% higher over the past twelve months. At the other end of the scale is the rural area of Outback Queensland, where values are 10.2% lower over the year. Mackay-Isaac-Whitsunday (-9.1%) and the Wheat Belt area of Western Australia (-8.9%) have recorded the second and third largest annual value declines. While many of the mining regions continue to show year on year declines in dwelling values, there are signs that many of these markets have moved through the trough of their cycle, albeit after significant declines in the value of housing. 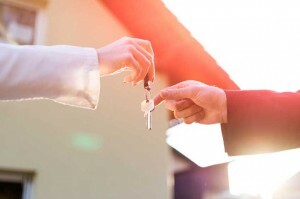 This slowing trend in rental growth is evident across five of the eight capital cities including Sydney, Melbourne, Adelaide, Darwin and Canberra. 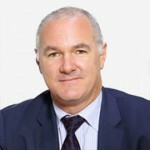 The slowdown in rental conditions is attributed to the combination of record levels of new dwelling construction over recent years, higher than average levels of investment which supports the introduction of rental stock, and diminished rental demand as more first home buyers become active in the housing market. 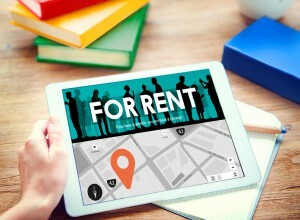 With dwelling values slipping lower across most cities, and rents gradually tracking higher in most markets, rental yields have seen some upwards pressure – albeit from a low base in some cities. 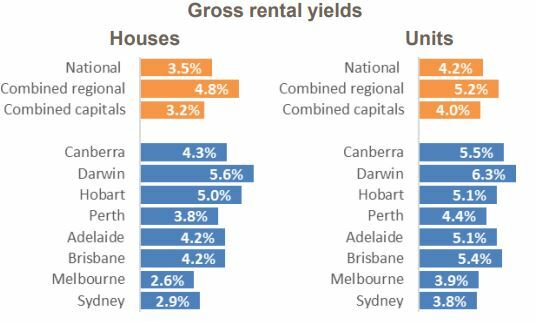 Darwin remains the highest yielding capital city: Despite a 1.6% fall in weekly rents across Darwin over the past twelve months, gross rental yields (5.8%) remain the highest of any capital city due to the fact that dwelling values are falling at faster rate than weekly rents. Hobart is also showing a high gross rental yield profile, averaging 5.0%. The lowest gross rental yields remain in Melbourne at 2.93%; only marginally higher than the record low of 2.88% set in November last year. With the 3.9% fall in Sydney dwelling values since July last year, gross rental yields have slowly pushed higher to reach 3.2% at the end of March, up from a recent record low of 3.0% in July 2017. Overall, the Australian housing market is currently showing every sign of recording a soft landing after national dwelling values peaked in September last year. 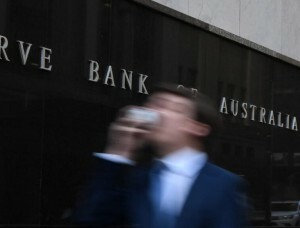 Lenders have overshot APRA macro-prudential benchmarks. One factor supporting this deceleration in value declines could be an improvement in credit availability for investors and interest only borrowers. Credit aggregates from the Reserve Bank show growth in credit for investment housing increased at an annualised pace of just 2.3% over the three months to February; well below the APRA benchmark speed limit of 10%. The latest statistics from APRA for the December quarter last year show interest-only lending comprised just 15.2% of new originations (down from a peak of 45.6% in June 2015). 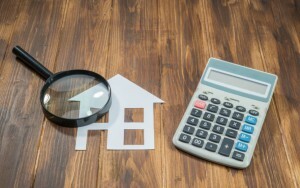 The new benchmark set by APRA in March last year was that interest only settlements should be below 30%, suggesting the major lenders could relax their credit policies to attract a higher proportion of interest-only and investor lending. Anecdotally, there has been some unwinding of the rate premiums added to interest only mortgage rates and investment mortgage rates which may be providing some support for a subtle rebound in market activity. Based on housing finance data, New South Wales has been the epicenter of housing investment over the current growth phase. Investors comprised a record level of 63.6% of mortgage demand across New South Wales in May 2015; although the concentration has reduced substantially, the latest data to January 2018 shows that investors still comprise more than half of the value of mortgage demand across the state, at 53.4%. This proportion bounced higher in January, suggesting investors may be staging a partial comeback as credit polices relax. Despite the potential improvement in credit availability for investors, rental yields remain low and credit policy is likely to be firmly under the spotlight following the banking Royal Commission. Considering these factors, even if the housing market is close to finding a floor, the prospects for a rebound in capital gains, as seen through late 2016 and early 2017, are far less likely.